1 Grill or broil chicken, brushing frequently with Dressing, 15 minutes or until chicken is thoroughly cooked. Top chicken with roasted peppers, then cheese. Grill or broil until cheese is melted. 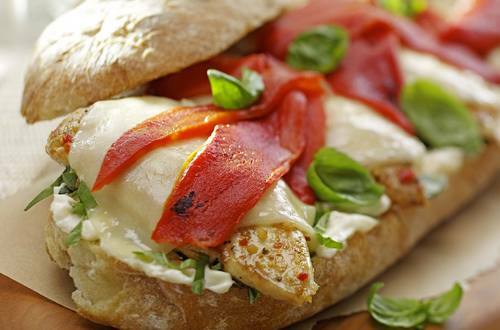 2 Meanwhile, spread Hellmann's® or Best Foods® Light or Real Mayonnaise on both sides of bread; sprinkle with basil. Arrange chicken on bread. Wrap in aluminum foil and keep warm. To serve, cut into 4 pieces.